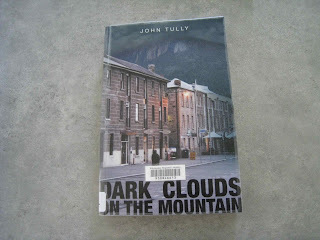 The Little House of Concrete Bookshelves: John Tully "Dark Clouds on the Mountain"
John Tully "Dark Clouds on the Mountain"
Given author John Tully's position as a lecturer in Politics and History at Victoria University it's safe to assume Dark Clouds on the Mountain is a one off rather than a title in an ongoing series. Apart from a number of titles in the realm of Southeast Asian history there's an earlier fiction title in Death Is the Cool Night that, based on this title is worth seeking out, but one doubts we'll be seeing any more of Jack Martin, born Martinuzzi, left-leaning Tasmanian detective with working class roots. There's plenty of detail here that would, in an ongoing series, have been glossed over, particularly when it comes to the back story. A series would have these details spread out, and Martin's past as a top athlete in a small town could have been an interesting element as he went about tackling issues (not necessarily murders, if the town's small enough to have that gun cricketer/footballer that people of a certain age remember years later you're not going to get an interesting murder case every couple of months). The broader community tends to have limited contact with the Police, so repeated oh, yes, I remember you incidents through a series would, I think, work, but this title is, as far as I can gather, a one-off. We've got the regulation family dramas you tend to get in a police procedural, lurking behind the main action with the threat of violence around the corner, though we see the aftermath rather than the actual incident. On the subject of aftermaths, it's the aftermath of World War Two, and the subsequent wave of immigration and its impact on working class Tasmania that drives the main plot lines. Martin's father was an Italian communist who fought with the partisans in the Balkans but was murdered in Hobart in 1948. Martin grew up with his mother, a hopeless alcoholic, and her father in Queenstown, did a trade, tried his luck on the mainland, but couldn't hack the big smoke. As a result he's moved back to the Apple Isle, joined the police force, married and now has a teenage daughter whose politics bring her into the edge of the plot line, so the paternal concern factor adds another aspect to the main character's mental processes. That's his back story, and it's one that ties in with a couple of others as antisemitic graffiti is scrawled on the synagogue in Hobart, a Greenie protest encampment is attacked in the forest near Queenstown and a Jewish tailor is found dead in Hobart. Other back stories work backwards to Nazi war crimes, death camps in the Ukraine, young left wing campaigners for Palestinian rights, right-wing extremism, Slavic prejudice and domestic violence. Throw in a touch of the old workplace rivalries and police corruption for good measure and you may be thinking formulaic, but it works. Run those elements together, and the result could be a messy tangle, but Tully keeps it tightly wound as the dark secrets, Nazi plots, family tensions interact in a web of intrigue. It's well paced, easy to read and full of seemingly authentic detail, real locations and sharply drawn characters in a predominantly working class setting. On the strength of this one I'll be seeking out Death Is the Cool Night and I'll be keeping an eye out for subsequent volumes. Highly recommended.